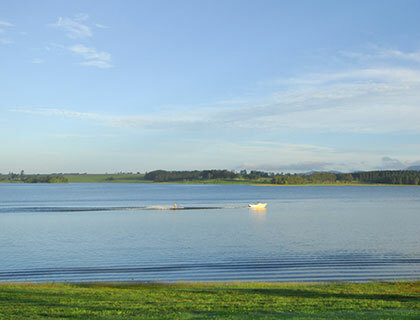 Lake Tinaroo and the Atherton Tablelands is one of Cairns and Tropical North Queensland’s best kept secrets. Located just one hour from Cairns city, this region is elevated by two mighty mountain ranges. The altitude provides a more temperate climate, which is comfortable year round and provides respite from the hot and humid coastal weather. The sweeping mountain ranges, which roll across the Atherton Tablelands providing a picturesque backdrop, are cloaked in World Heritage protected Tropical Rainforest, which is home to an amazing and diverse array of flora and fauna. Meantime the calm waters of Lake Tinaroo provide water sports enthusiasts with a plethora of activities to choose from, including: fishing, sailing, waterskiing, swimming, canoeing and wind surfing. Formed in the 1950s, Lake Tinaroo has become the region’s draw card for water sports, attracting tens of thousands of visitors each year. When staying at The Edge, your closest township is Yungaburra which has long been recognised as the Atherton Tableland’s food and accommodation capital. Boasting country charm and buildings which date back to the early 1900s, Yungaburra has restaurants, a spa, markets, grocery store and a butcher. The Edge is set on the shores of Lake Tinaroo, providing absolute waterfront and private access to the lake itself. Set on 1,850sqm of grounds, The Edge has rolling lawns and landscaped gardens including citrus trees. There are nice walks around the property, where you may see some local birdlife, pelicans, ducks and geese, or maybe some wallabies. 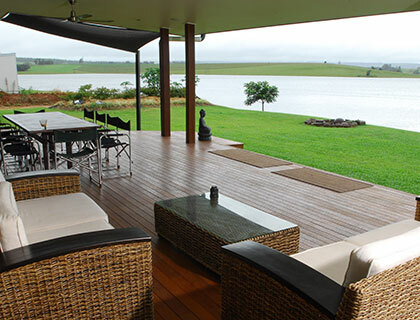 You can just relax on one of The Edge’s day beds and watch the sun set over the waters of Lake Tinaroo.